Click here to get tickets to see Hiroya Tsukamoto on December 7 & 8, 2018, at 7:30 pm! There are a lot of ways you could describe Hiroya Tsukamoto’s music – impressionistic, compelling, emotional – but the one word you would never use is ordinary. In fact, his music almost defies conventional explanation. “I’ve been having a hard time describing my music because what I do is a mixture of a lot of different things. A lady, one day in North Carolina a couple of years ago, came up with the idea of Cinematic Guitar Poetry. I like the term because my music is somewhat cinematic, mesmerizing, but also I do a lot of storytelling along with the music,” Hiroya said. At times swelling and grand, other times soft and melodic, Hiroya’s music really does take the audience on a journey. His original compositions bring to mind places he has traveled and memories from his childhood. “People who come to my concerts say that my concerts are like watching a film. They say the entire show is like one film. And then they sometimes say it’s like traveling to different places through my show. That’s good, that’s what I’m trying to do. Also, when I play music, I think about the moment and place where I was when I wrote the song, like in a small village in Japan with my grandparents. I try to go different places with my music,” Hiroya said. TOCA Backstage: A conversation with singer-songwriter Hiroya Tsukamoto! Hiroya started his musical journey at the age of 13 when his father brought home a banjo one day. 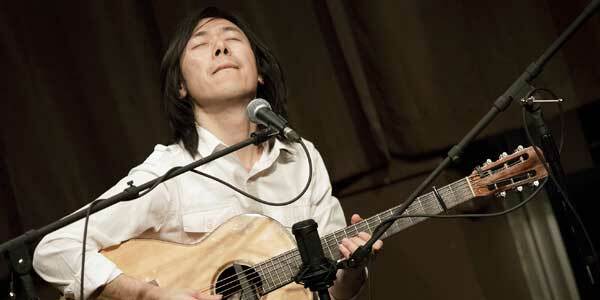 American folk music had made its way to Japan recently, and he fell in love with the instrument. However, there weren’t any banjo teachers in Japan to help him learn how to play, so he taught himself by listening to a bluegrass album by Earl Scruggs. Soon after that he picked up the guitar. Many of his friends were playing and they, along with the availability of guitar lessons, convinced him to give it a try. Over the years he’s studied all kinds of music, from jazz to South American folk music, even starting and touring with a band called Interoceanico. He earned a scholarship to Berklee College of Music, which is what brought him to the United States initially, and he now resides in New York. “My advice to up-and-coming musicians is to be natural, original, rather than adhering to a certain point of view. Play and hone your own style of music,” he said. Hiroya Tsukamoto’s performance is part of the Studio Cabaret Series at TOCA. The Studio Cabaret Series is a way to enjoy musical talent and tasty food in an intimate setting; it’s like dinner theater for your ears! The performances are set in the George Nakano Theatre at four-seat cocktail tables. Meals for the Series this season are prepared by the talented chefs at the Red Car Brewery. Dinner for the performances of Hiroya Tsukamoto will be Asian dumplings, sesame chicken salad, and soy ginger beef. Plus goodies from the always-delicious Torrance Bakery will be available at intermission. Enjoy an evening of unique music and delicious food at the Torrance Cultural Arts Center! Tickets are still available to see Hiroya Tsukamoto on Dec 7 & 8, but they won’t last long (the Studio Cabaret Series is our best seller). Get your tickets today! Get Tickets to See Hiroya Tsukamoto!